General-purpose tools I have developed. They are provided as-is with no warranty or support of any kind, other than “best effort” if I have time. Write a comment if you have a problem or suggestion. Splitting strings before they’re CLOBs! After I tokenized two CLOBs in response to a forum question, Andy Sayer mentioned that they were probably files first. So I smacked my forehead and used external tables. When the light bulb went on, I saw that the comma needed to be a record delimiter, not a field separator. Easy. In a recent ODC thread, the question was how to split out comma separated values from two CLOBs, one containing “item ids” and the other “item keys”. The ids and the keys had to be matched by position: the first id with the first key, the second id with the second key, and so on. Then each id/key pair was to be inserted as a row into a target table. With 50,000 ids of 7 characters and 50,000 keys of 172 characters, the current processing takes 2 hours. First I’ll create a table with the two CLOBs. The PIPE_CLOB function: a pipelined table function that reads a CLOB and outputs up to 4000 bytes at a time, respecting a delimiter. The STRING_TOKENIZE function: a pipelined table function that splits a VARCHAR2 string according to a delimiter. All I have to do is feed the output from the first function into the second, and voilà! Remember, the requirement was to combine the values from both CLOBs by position, in order to insert them into a target table. Since the functions return the values in order, I just use ROWNUM to number the values and use that number to join them. That’s right, processing time went from two hours to less than one second. My last post had code to rewrite SELECT statements that tried to access public package variables. Here I’ll integrate the code into the SQL Translation Framework. Use this only in development environments. You normally use the SQL Translation Framework for database migration. The idea is to translate SQL statements from non-Oracle syntax to Oracle syntax, test the translated statements and ensure that the translations are used instead of the original. You don’t want to do all that work every time a statement is submitted to the database, and you don’t want to do it for every statement. In fact, Oracle drivers can now allow applications to say which statements are to be translated and which are to be left alone. The translation service is enabled at the session level. At that point, every statement execution is preceded by a “parse call” and the execution of my TRANSLATE_SQL procedure. Those “parse calls” will result in “soft parses” since the statement already resides in the library cache. That is still unacceptable overhead in any production-type environment. I would add that on-the-fly translation in production would cause havoc if it ever stopped working, and would complicate debugging considerably. In fact, I highly recommend just using the TRANSLATE_SQL procedure as presented in my previous post. You can then see, edit, test and deploy the result. You might want to use on-the-fly translation if you are writing a SELECT statement that accesses package variables and you want to make and test changes faster, but that’s it. -- initialize with clause and select sql. Make sure input is 32k max. -- replace identifier by function call. I recently posted an experimental approach to accessing package constants from SQL. Here is a more robust approach that includes all variables. Within PL/SQL, SQL statements can be either static or dynamic. Static SQL can access any PL/SQL variables that are within scope, including variables defined in package specifications. PL/SQL rewrites the statement, putting a bind variable where the PL/SQL variable was and binding the value before execution. Dynamic SQL, whether submitted from PL/SQL or any other language, cannot directly access package variables, even though they are part of the published specification. This frustrates developers, since access to functions has no such restriction. Getter functions are a workaround, but they are no fun. Table functions: whether pipelined or not, table functions can submit static SQL but be accessed by dynamic SQL. This approach is not very flexible, but when it fits the bill it can be used in production today. Literals: for constants only, rewrite the SQL and replace package constants by their values, as found in DBA_SOURCE. My previous post tried this. Bind variables: this would mimic what PL/SQL does for static SQL. To be a full solution, the values would have to be looked up and bound before executing the rewritten statement. Starting with database version 12.1, we can declare PL/SQL functions in the WITH clause of a SELECT statement, so that is where I’m going to put my getter functions. By declaring the function to be deterministic, it is called once per execution and not once per row – at least in my tests using 18c. There appears to be no need to use scalar subquery caching. Unlike the “literal” solution, any package variable that is valid in static SQL will be valid in the rewritten SQL. There is no need to access the values of the variables in order to bind them. The %type attribute ensures that the function returns a value of the same data type as the package variable. Before making and using a getter function, I have to know that my SQL is trying to access a package variable! Instead of trying to reinvent parsing, I use the DBMS_SQL.PARSE procedure. I can also access the “last error position”, which gives me the location of the package variable within the SQL text. I now have enough information to extract the package variable text from the SELECT, generate a getter function and call that function instead of referencing the variable directly. After that, I go through the same parse / replace operations until the statement parses without error. Please note that if there truly is an invalid identifier in the statement, the generated getter function will cause the next parse to fail with a different error message, which is enough to raise an appropriate exception. Requires database version 12.1 or later. Tested in 18c. This version is restricted to SELECT statements. There may or may not be a preexisting WITH clause. The SQL statement, including the generated getter functions, cannot exceed 32767 bytes in length. 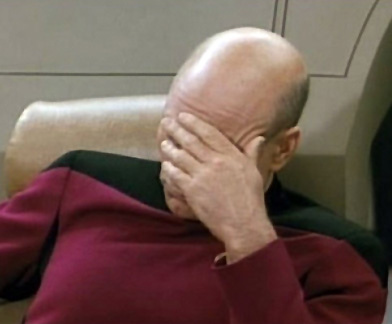 When I try to parse anything longer, DBMS_SQL gives me the wrong last error position. At this time, I do not handle quoted identifiers. I can handle the spaces, but not the comments. If you want to access a boolean in SQL, this utility can’t help you. The code here just rewrites the SELECT; it doesn’t use the SQL Translation Framework to execute it directly. Maybe next time? This is an enhancement request on ODC and a recent Twitter topic. Here is a homemade solution using the SQL Translation Framework. UPDATE 2018-12-31: this solution became obsolete pretty quickly! Please see this post for a much better solution. When executing static SQL inside PL/SQL, the developer can directly reference package variables because PL/SQL will automatically treat them as bind variables and bind the correct values. If the developer wants to test the SQL statement outside of PL/SQL, he/she discovers that the package variable is interpreted as a package function, which of course does not exist. The package I wrote can create a translation profile, enable it, disable it and drop it. It also contains the TRANSLATE_SQL procedure that does the work. It is meant strictly for development environments as a transparent workaround. The procedure parses the statement, and if it finds something that can be a reference to a CONSTANT variable defined in a package, it substitutes the value found in DBA_SOURCE. Remember, this is only to help developers. It is not something to ever deploy in a test or production environment. I frequently use what I call “SQL templates”, where I replace multiple placeholders by calculated values. Here are two methods that don’t require a stored procedure. What do I mean by “template”? SQL statements have to be parsed before they can be executed. The standard way to minimise parsing is to use bind variables. If we use a bind variable instead of a literal, the same statement can be parsed once and executed many times with different values assigned to the variable. We cannot put the names of tables or columns into bind variables: these are data objects that have to be known at parse time. What I mean by “template” is a SQL statement with a specific logic, but without the names of the data objects. I get the names I need from input parameters and queries, then I put them in the statement where the placeholders were. If I do this twice with different parameters and the resulting text is different, the optimizer will of course parse each result separately before execution. So: don’t confuse this technique with bind variables. Please keep in mind that I never use this technique in production. I generate the SQL, read it, test it and then deploy it. This technique is meant to make SQL development more productive, not replace the developer. If you ever want to generate SQL in production, work very hard to avoid SQL injection bugs. For example, use DBMS_ASSERT or data dictionary lookups to make sure input parameters are really data objects. This statement is not a template and it doesn’t use bind variables. This statement is not a template, but it uses a bind variable. This is a “template” as I use the word here. It shows the logic for comparing two tables using the GROUP BY method. To get a usable SQL statement, I need to replace all the placeholders (enclosed in #) by real values. Put the template text in the TEMPLATE subquery. In the PARMS subquery, create one row per replacement: V_FROM is the placeholder and V_TO is the value. The MODEL clause will iterate through the reference model P and do each replacement in turn. Here is an example that generates a comparison. It’s a silly example because I am comparing EMP to itself, but it’s just for illustration! The problem with the MODEL technique is that the output cannot be a CLOB. To get a CLOB, suppose we use a bit of PL/SQL in a WITH clause? Now we have to pass the placeholder / value pairs as parameters. I decided that a JSON object would be a reasonable implementation. Warning: this looks nice but requires version 12.2 or later. The PL/SQL function parses the input JSON object, gets all the keys (the placeholders), then uses them to get the values one by one and apply them to the template. The JSON_OBJECT function in SQL turns each placeholder / replacement pair into a JSON name:value pair. I like this approach because it shows each placeholder and its replacement value side by side. It’s just easier for me to read (and write!). With these parameters, we cannot embed record delimiters within quotes. When the field has no enclosures, all characters between commas are output, whitespace or not. 9-13, 32 (space) – and 17 others if AL32UTF8! If there is a field delimiter at the end of a record, it ends the field but does not start a new field. I admit that 3.A. (whitespace OK before and after enclosures) was a surprise to me. 3.E. : I don’t care whether a character is whitespace or not. I ignore extra newlines in the input, but I don’t attempt to suppress output with all null fields. This code should probably be written in C, which allows direct access to each character in a string. However, anyone who can install a C program on the Database server can probably copy the CLOB to a file and use External Table functionality directly! To make my PL/SQL as fast as possible, I use a technique from my COBOL and C days: the GOTO. With this type of code, calling subprocedures would measurably increase CPU usage. > EXCEPT: I allow no whitespace between field enclosures and field terminators. all are hard coded for the moment. - record delimiter cannot be embedded in enclosed field. - If there is a field delimiter at the end of a record, it ends the field but does not start a new field. - I ignore extra newlines in the input, but I do not try to suppress output with all null fields. I took five columns from DBA_OBJECTS and added one VARCHAR2(100) and one NUMBER(4). 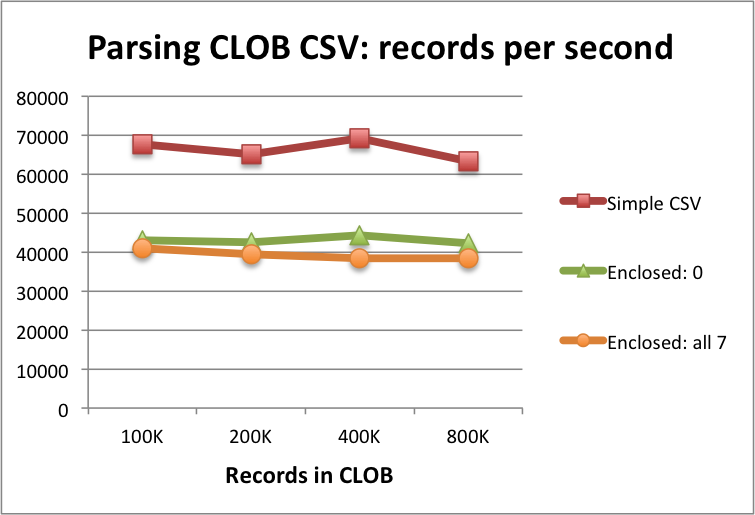 I tested with four sizes of CLOBS: 100,000 records, 200,000 records, 400,000 records and 800,000 records. I compared input with no enclosures and with all fields enclosed. Compared to the “simple” CSV solution, this solution is about 50% to 70% slower, depending on how many fields are enclosed. However, the number of records extracted per second remains stable as volume increases.